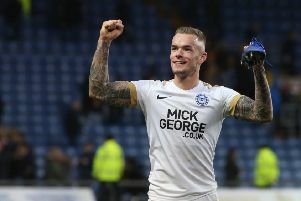 Three Peterborough United players are in the running for the PFA Bristol Street Motors League One Player of the Month Awards for August. Strikers Jason Cummings and Matt Godden, plus winger Sirik Dembele, are among six nominations. The winners will be decided by a public vote. Siriki Dembele celebrates his goal for Posh against Luton. Photo: Joe Dent/theposh.com. The three are the most productive front line in the top four divisions of English football with 12 goals and seven assists between them. Other players nominated for the award are Dimitri Cavare (Barnsley), Jamal Lowe (Portsmouth) and Josh Maja (Sunderland). To vote, visit the PFA website at https://www.footballfancast.com/pfa-awards?utm_source=Direct.